At Big Creek Lumber, we feel that the best way to transform an outdoor living space is to put in a new deck. 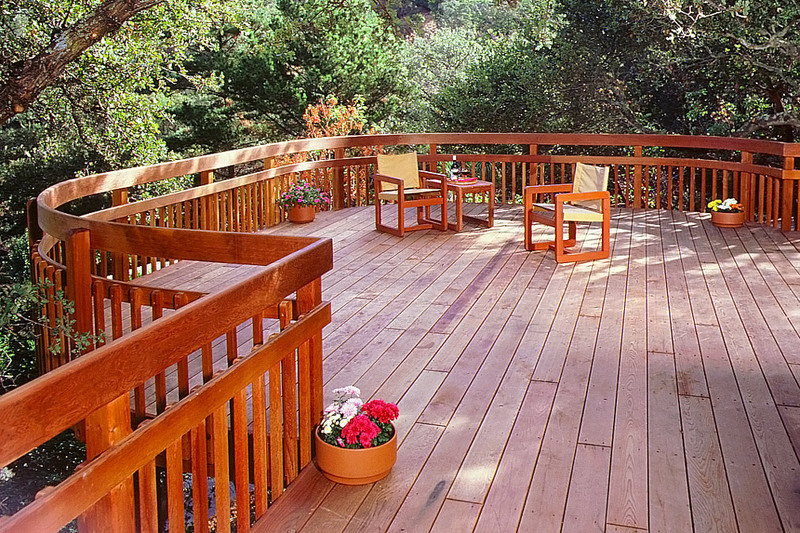 We supply many kinds of decking material, including composites, but redwood is our specialty. Local contractors prefer the high-quality, locally and sustainably grown redwood decking produced at Big Creek’s sawmill in Davenport, CA. Our primary decking products are 2×6 Construction Heart (Con Heart) and Construction Common (Con Common). They have similar knot structures and are available in 8-20 foot lengths. Con Heart is all red in color, while Con Common has a combination of red and blond wood. The red heartwood contains tannin, which make it resistive to decay and damage caused by insects. It works well in damp environments where you need a product that is both beautiful and durable. Redwood Con Common does well in dry, arid climates. It is affordable and adds value to any home. Higher grades are only available in random lengths. If you prefer composite decking, we are authorized dealers for most of the top brands. Visit our Composite Decking page for more info. Big Creek Lumber’s friendly and knowledgeable staff and online resources can help you get what you need to get the job done.